This week we are learning to find the difference between 2 numbers by counting on. Write the small number at the start of the line and the big number at the other end of the line. Start with the smallest number. 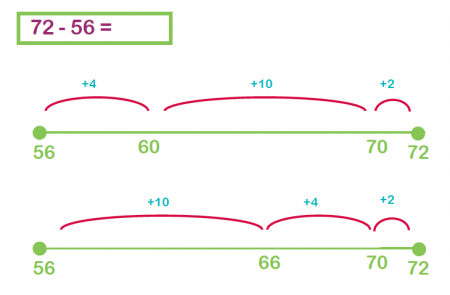 Jump to the nearest 10 using your number bonds or jump/ jump on in tens until you are close to the target number. Jump on what is left. Watch the clip and play the games. 04.11.14 This week we have been looking at Symmetry. Look at the fantastic symmetrical pattern Stan, Aimee and Freddie have created! Why not collect some objects of your own at home. Don't forget to start by deciding where the mirror line will be. You could do it outside and chalk a mirror line. 5.11.14 Today Sophia and her partner Ebony-Rose took on the challenge of making a symmetrical pattern that is reflected in 2 mirror lines. They used straws to show the mirror lines. I am very impressed with the way that you used the wooden handwriting blocks and turned them over because you knew that you couldn't make the letters symmetrical. They would have to be backwards! Has your child got a bug or rash?